Beethoven composed his Piano Sonata No. 4 in E-flat major, Op.7 in 1797 in Vienna. Is it possible he had the first Gavotte from Bach’s Third Orchestral Suite in D major, BWV1068 in his ear at the time? As I was playing through this Beethoven Sonata this summer, I noticed that a passage from the third movement bears a striking resemblance to the principal theme of Bach’s Gavotte. The pertinent passage in Beethoven’s work is in E-flat major compared to the gavotte’s D major key, and the principal melody of the former lies in the same register as the latter, being a mere half-step higher. 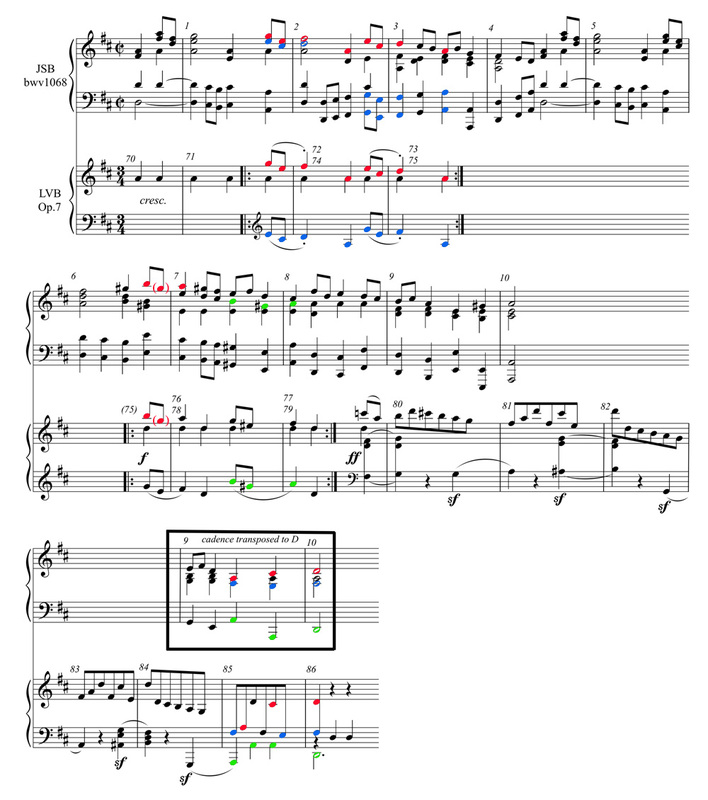 For a closer comparison of the two passages, I transposed the Beethoven passage down a half-step to D major, the key of the gavotte, and put them side by side. Click the image to embiggen. The short-short-long pickup figure combined with the descending 3rd—ascending 2nd contour is obviously a prominent one. The figure itself is rather commonplace, and I could perhaps just as easily have found any number of pieces predating the Beethoven Sonata with which to compare it. Yet, the way in which the Bach Gavotte was immediately conjured up in my memory when playing through the Beethoven passage leads me to believe there might be more to the connection. Two additional correspondences between the passages may have contributed to the immediacy of my memory-jogging: 1) the nearly identical register the two melodies occupy being a mere half-step apart, and 2) the parallel thirds followed by parallel sixths in both passages (Fa-Re-Mi above Re-Ti-Do is followed by the opposite, Re-Ti-Do above Fa-Re-Mi). Furthermore, in both passages, the parallel figures are connected via a rearticulation of the dominant below: Fa-Re-Mi—(Sol)—Re-Ti-Do, etc. In the Beethoven, the La-Fa-Sol (mm.75-76) that follows the repetition of the Fa-Re-Mi, Re-Ti-Do pattern maps onto the La-Fi-Sol that appears in measure 6-7 of the Gavotte, a figure that tonicizes the dominant. Both passages lead ultimately to a cadential 64 figure in the lowest register of both melodies. There are other, more general similarities in these two movements. 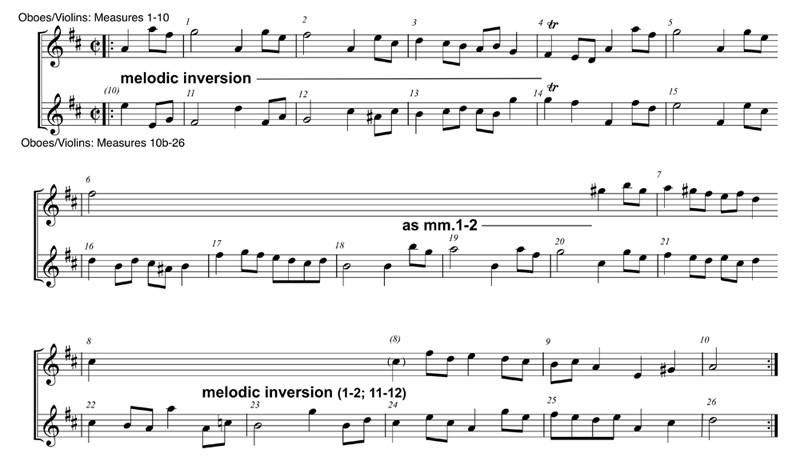 Other sections of both movements prominently feature a metrically shifted version of the short-short-long figure. a version placed on the beat. Beethoven seemed preoccupied with such metric shifts throughout his movement. (See for example measures 3-6 at the movement’s opening.) Bach’s Gavotte II, which immediately follows and is followed by Gavotte I in a minuet-and-trio-like da capo form, prominently features a metrically shifted version of the figure as well. So back to the initial question: Is it possible Beethoven had the Gavotte in his ear, whether consciously or subconsciously, when composing this passage? While my very cursory search for references to the Bach Orchestral Suites in several Beethoven sources in our college library turned up nothing, the Grove’s article on Beethoven did shed a some light. In the section describing the early years after his move to Vienna in 1792, the author describes the rich Viennese musical culture highlighting the large number of aristocratic patrons actively supporting music, some of whom even “kept private orchestras.” One figure in particular, Baron van Swieten, with whom Beethoven was well acquainted, is identified as being “an early representative of the Bach revival.” He is said to be responsible for sharing the music of Bach with Mozart and Haydn, as well as Beethoven. The Baron connects LVB and JSB in another interesting way: he became the dedicatee of both Beethoven’s First Symphony and of Forkel’s 1802 biography of Bach. So, yes, it is certainly possible that Beethoven heard the Bach Gavotte in Vienna and had the piece somewhere in his consciousness when composing his 7th Opus. And speaking purely intuitively as a composer, when comparing the two passages, the Beethoven has the look of one that might have been subconsciously derived from the Bach. I’m not sure exactly what I mean by that, and it’s probably all folderol. But way in which the Beethoven version looks like a truncated version of the Bach is just the way my not-entirely-conscious memory sometimes pieces together fragments of a piece of music lodged in the depths of my past experience. You probably know the kind of memory-jogging I mean. Right? Then again, this would imply that Beethoven’s brain worked in a way similar to mine. Not likely. Surely this is all poppycock! I end with the entire Bach melody, with the second half being mapped onto the first. Fantastic music! This entry was posted in Uncategorized and tagged analysis, bach, Beethoven, comparison, gavotte, sonata. Bookmark the permalink.